Charmingly Chocolate. Marching Through March! Finish out the season with a fun fling, and don't forget to celebrate Easter with joy! Easter is a little earlier than usual this year. Easter is a special holiday to me because of the glorious Resurrection of my dear Saviour. I'd love to share with you why Easter is so special to me if you'll let me. March can be a dreary month for some people. Winter is dragging on a little longer than you'd like. You're itching for a change in the weather. If you happen to live in the southern hemisphere, perhaps it's the heat and humidity that you've had enough of for a while. Either way, some folks struggle. I've got a solution to lift your spirits and get you through the month feeling great. 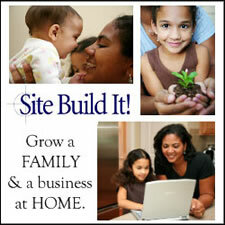 Let me suggest a candy making spree that will bring laughter and fun to the whole family. Making taffy is so much fun. Yes, it's messy, but if you take a few precautions, you can keep the disaster down to a minimum. Cover the floor with a painter's cloth and cover the counter tops with butcher paper or waxed paper. The kids will really enjoy being part of an old fashioned taffy pull. Combine sugar, cocoa, salt, corn syrup, water, and vinegar in a heavy pan over medium heat. Stir together until sugar and cocoa are completely dissolved. Raise the heat and bring mixture to a boil. When it boils, lower the heat again and cook until the temperature reaches 260 degrees F. on a candy thermometer. Remove from heat and stir in the butter. Pour into buttered and waxed paper lined baking sheet and allow to cool for a couple of minutes. When the candy is cool enough to touch without burning your fingers, butter your hands well and begin kneading and folding the mixture in on itself. This is the time when you bring the kids in on the act. Pull the taffy back and forth on itself, twisting it as you go. Before long (about 10-15 minutes) the color will lighten and the taffy will get shinier. 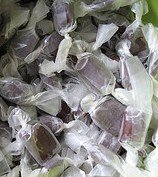 Pretty soon it will be too hard to pull so don't wait too long to roll the taffy into ropes and cut into small pieces. Wrap each piece in waxed paper squares and store in an airtight container. Now, doesn't that sound like a whole lot of fun? In case you have forgotten, Easter is coming up at the end of the month, March 23. Have you made plans for your Easter treats? There are a number of delicious Easter candy recipes you can make for your family and friends. What About Gift Ideas For Easter? Is there someone to whom you'd like to send a special Easter gift? Let me make a couple of suggestions. 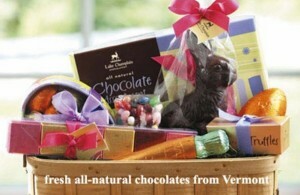 Lake Champlain Chocolates is one of my favorite suppliers. They have a gorgeous variety Easter chocolates to choose from. There are baskets, and eggs, and bunnies, and truffles, etc. My second suggestion is Fannie May Candies. 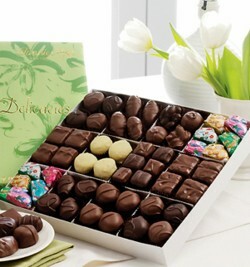 Their candy is outstanding, and they are even offering free shipping on orders of $20 or more. Just Use coupon code 10107. Well, that's about it for this month. Don't forget, you can always pop on over to Chocolate Candy Mall for great recipes and other gift ideas if you want to whip up a batch of fudge or some other chocolate candy indulgence for your family or loved one. We are always adding new ideas every week or so. See you there! I did want to pass on this bit of information on to any of you who have been thinking about the whole idea of working at home this year. I'm more amazed than anyone that I have been able to build Chocolate Candy Mall. It's been a challenge and a thrill to take it on and succeed.